In July, 2014, Mike Patterson received some news that changed his life forever. He was diagnosed with stage four colon and liver cancer. “They didn’t give me a lot of hope,” recalled Patterson. Like many patients after receiving such a diagnosis, Patterson asked for a second opinion. However, he was given the same grim verdict and began looking at treatment options. With very little time and few options, it was decided that chemotherapy was the best route. After several months of treatment, and no progress, Mike’s team of doctors decided to schedule his surgery on December 12, 2014. A date that now holds great significance to Mike. This date was picked by his surgeons and happens to be the feast day of Our Lady of Guadalupe, which celebrates a religious apparition of the Virgin Mary. While Patterson was going through chemotherapy treatments, he was paid a visit by his friend, Brother Mauricio. 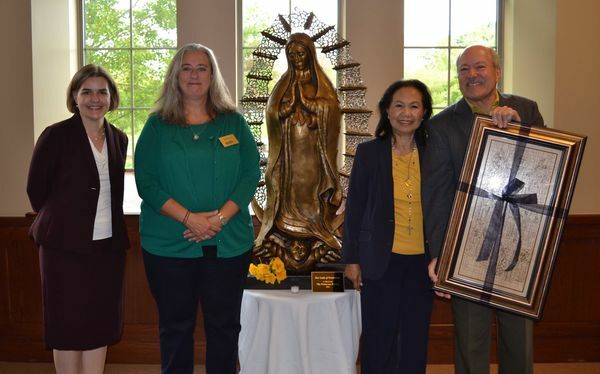 Brother Mauricio traveled to the United States from Mexico and brought with him the shroud of Our Lady of Guadalupe. With the shroud, he prayed with Mike to defeat this monstrous disease. Patterson recovered from his surgery with no complications. A couple weeks after surgery, Mike visited his oncologist for a post-operation check-up. He showed no signs of either cancer. Patterson said, “They couldn’t give a medical explanation for what happened or how it happened … I instantly went from hopelessness to complete gratitude.” Ever since, Patterson has been determined to do all he can with the resources he has, to help eradicate this disease. 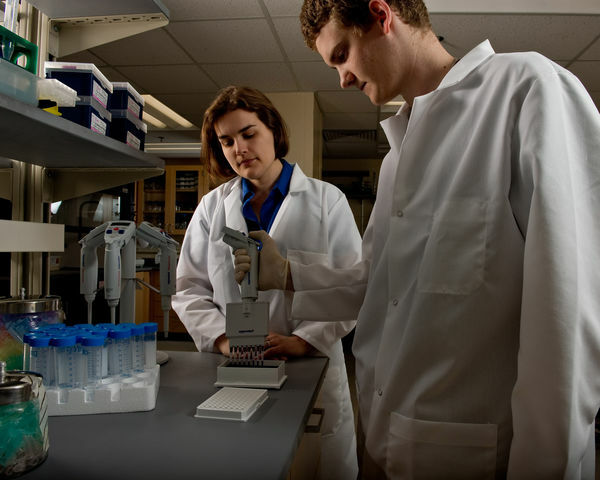 During the Fall of 2015, Patterson learned about the cancer research being conducted at the University of Notre Dame’s Harper Cancer Research Institute. Here he was introduced to the work of Amanda Hummon, associate professor of chemistry and biochemistry at Notre Dame and exceptional colon cancer researcher at the Harper Cancer Research Institute. While she was in graduate school at the University of Illinois at Urbana-Champaign, Hummon lost her father to colon cancer; he was only 59 years old. The experience altered her career path. After graduate school, she accepted a Postdoctoral Fellowship position at the National Cancer Institute (NCI). During her time at the Institute she quickly learned that many of the people at NCI have a similar personal motivation behind their work. Hummon learned of the strong genetic component behind cancer, especially colon cancer, affecting the same family over and over again. This is a huge part of why she is committed to studying the molecular mechanisms that fuel the disease. “I don’t want to see my children, or my future grandchildren, develop this disease … I want to help all families facing this disease,” she said. The relationship between Patterson and Hummon is a perfect match for what each are trying to accomplish. Patterson has always had a very strong affiliation with Notre Dame and has been extremely generous to the University. After learning about the Harper Cancer Research Institute, Patterson knew what his next step would be to fight this disease – a donation to a very bright scientist with very promising research. Hummon is referring to the generous donation handed to her for an idea she has for colon cancer. Typically, principal investigators (like Hummon) spend weeks and months writing grants in order to fund their research. For Hummon to receive a gift of this opened so many doors, including the opportunity to follow a different avenue in her research, which she did not previously have the means to do. An exciting avenue that might be investigated with these funds is the effect of caloric restriction on cancer patients. Studies have shown that when this technique is performed on mouse models, they live a longer and healthier life with lower disease rates. When looking at caloric restriction from a molecular perspective, it is thought that cells are going through a process of eating themselves when they are unable to find food. When cells divide, they have extra materials (i.e. organelles) lying around which isn’t healthy. If your cells are hungry enough, they will start eating the extra material. Instead of having the cells focused on proliferating and dividing, the hallmarks of cancer, they focus on survival. There is evidence that shows having caloric restriction can reduce cancer risk and can make the cells more vulnerable. Some researchers have found that if you use caloric restriction, then hit the cells with chemotherapy, the cancer cells die at a much quicker and sometimes amazing rate. Cancer cells are constantly hungry and need a lot of sugar to survive because they have higher glucose demands. Monica Scholl, a graduate student from the Hummon Lab has started a project investigating the molecular changes that underwrites the sensitivity of colon cancer cells to the combination of chemotherapy and caloric restriction. “We have done this in three-dimensional cell cultures and published a paper on this project this past summer,” she noted. The feedback from the paper was that this work should be done in mice, which now is the planned course of action. They plan to purchase mice with colon cancer, perform caloric restriction, meaning put them on a very low calorie diet and then treat the mice with chemotherapy. Often, cancer patients going through chemotherapy have very little appetite which makes this technique seem feasible. Originally published by Jenna Bilinski at harpercancer.nd.edu on November 16, 2016.